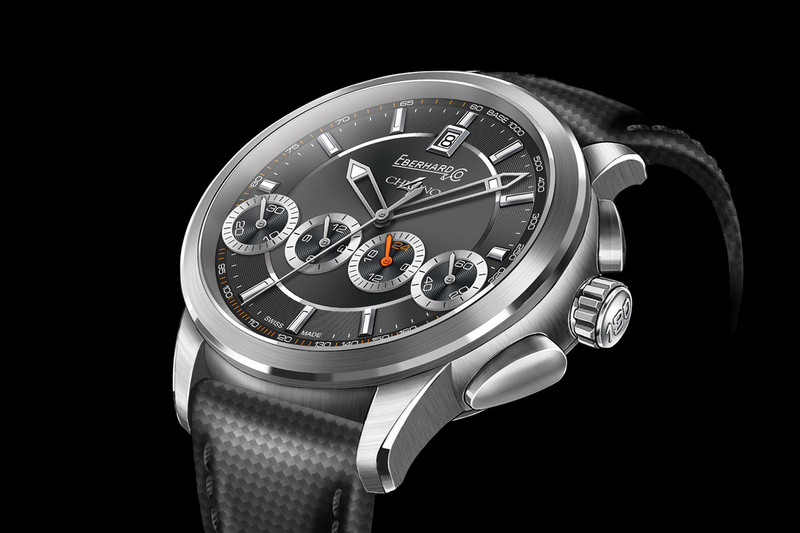 Chrono 4 130 celebrates the 130th anniversary of Eberhard & Co. and expresses its capacity to constantly reinvent itself in ways that show its pride in its origins without ever giving up an ounce of its independence. This new timepiece, with its bold personality and sporting style, is distinctive for the "130" inscribed on the crown that is elegantly flanked by the wing-shaped chronograph pushers. A registered design, the four counters horizontally align across the dial in grey, silver tones or black, complete with orange or blue accents. The centre of the dial catches the eye with its diamond sunbrushed finish, while the snailed finish of the outer rim provides contrast and a backdrop for the luminescent markers to stand out. The strap in grey-black carbon wear lends the finishing touch and accentuates the contemporary elegance of the whole. Mechanical automatic, EB. 251 12’’’ calibre on an ETA 2894-2 base, Eberhard & Co. registered design with 4 in-line counters, 53 jewels. Hours, minutes, seconds, chronograph, date, 24-hour display, tachymeter. Satin-finished and polished steel, 42 mm. Bezel with circular satin finish and polished intermediate cylindrical section. Sapphire crystal with anti-reflective coating on the inside. Screw-down back with raised pattern and Chrono 4 130 logo. Water-resistant to 50 metres (5 bar/165 ft). Grey, silver-toned or black. Four snailed counters for minutes, hours, 24 hours and small seconds. Date window at 12 o'clock. Luminescent hour-markers and hands. Grey-black carbon wear with E&C personalised buckle or patented Déclic® buckle in steel. 130-piece limited series with skeleton dial and sapphire crystal back.